My Uncle Gary recently suggested I make a butter pecan ice cream with Kentucky bourbon. He has an incredible sweet tooth that is practically unmatched, though I think my mom (his sister!) could give him a run for his money. We have yet to put that to the test, but I will say, this obsession with baked goods and sweet things definitely runs in the family. I saw this Butterscotch Pecan recipe in David Lebovitz's The Perfect Scoop, which called for scotch whisky, and I was on my way to sort-of fulfilling my uncle's request! The funny thing is, while looking to see if I had scotch whisky in stock, I also discovered I had Kentucky bourbon, and a whole lot of other liquor. I'm not really a drinker, but my liquor cabinet is pretty impressive. Mostly so I have every option under the sun to bake with! You never know when a recipe will call for a tablespoon of brandy or a splash of sherry, a little tequila or a capful of amaretto. I've got it all! Pastry chefs across America would be proud. 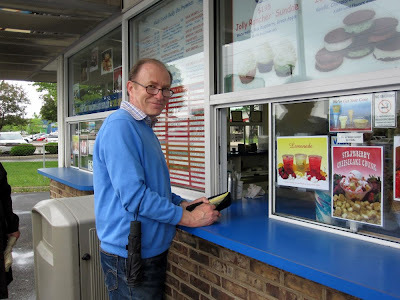 Uncle Gary, my inspiration for making this ice cream. I wish I could mail him some! And by the way, he happens to be ordering ice cream in this photo! This butterscotch pecan ice cream is fantastic. Don't expect it to taste like those suckable butterscotch candies. It's more of a brown sugar-butter flavor with nuts, or what most people call butter pecan. You prepare the pecans separately first and then toss them into the ice cream maker during the final moments of churning. I've served this to several friends now, and it is quite a crowd-pleaser! Try it! In a medium saucepan, melt the butter with the brown sugar and salt. Whisk in 1 cup of the cream (you'll still have 1 cup remaining) and all of the milk. Warm this brown sugar and cream mixture. Pour the remaining 1 cup cream into a large bowl and set a mesh strainer on top. In a separate medium bowl, whisk together the egg yolks. Slowly pour a tiny bit of the warm brown sugar mixture into the egg yolks (maybe a few tablespoons, one tablespoon at a time, but do not add ALL of the mixture into the egg yolks), whisking constantly, then scrape all the warmed egg yolks back into the saucepan. Stir the mixture constantly over medium heat with a heatproof spatula, scraping the bottom as you stir, until the mixture thickens and coast the spatula (you've just made custard!). Pour the custard through the strainer that's resting on top of the bowl with cream, then stir. Add the vanilla and scotch, and stir until cool over an ice bath. Chill the mixture thoroughly in the refrigerator (I recommend a full 24 hours), then churn it in your ice cream maker according to the manufacturer's instructions. During the last minute or so of churning, add the Buttered Pecans that you prepared ahead. I tend to prefer to chill my ice cream in the freezer and let it set more, but you can also serve this ice cream straight from the machine and it will be very soft serve. Melt the butter in a skillet (the microwave works just fine!). Remove from the heat and toss the pecans with the melted butter until well coated, then sprinkle with the salt. Spread evenly on a baking sheet lined with foil and toast in the oven for 10 to 12 minutes, stirring once during baking. Watch to make sure you don't burn the nuts. To add the buttered pecans to the ice cream, chop them coarsely and add them to 1 quart of ice cream during the last minute of churning, or you can just sprinkle them over when serving the ice cream. Note: Buttered Pecans can be stored for up to 2 days in an airtight container at room temperature. I love your story about how my brother (your uncle) inspired you to choose this flavor. He has great taste! It would be fun to see which of us has a bigger sweet tooth! I wager a chocolate cake that I would win!! Oh man, butter, pecans, and scotch? Why don't you throw in beautiful sunsets on the beach and laughter while you're at it? Mom - I think we should finally put the challenge to the test! You sound pretty darn confident you'd win! Alex - You're hilarious. Maybe next time I'll bake a sunset, too! Uncle Gary - I can't wait to see you go up against my mom!! Kelly-Jane - I hope you finally get around to it! It's SO worth it!